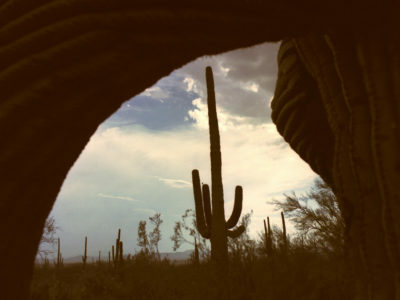 A 3-act performance project using innovative storytelling, public engagement and theater/dance performance to celebrate natural and cultural significance of the saguaro cactus, keystone species of the Sonoran Desert. Presented by Borderlands Theater and anchored in Saguaro National Park, it was part of the 2016 commemoration of the National Park Service’s Centennial. ACT I was a public campaign to befriend, celebrate, and connect with the cactus. Over 250 people stood (or sat) for up to an hour with a saguaro cactus in intimate individualized performances/meditations and shared their experiences and “saguaro selfies” online using #IStandWithSaguaros. ACT II gathered stories of the many relationships we have with the cactus in a radio program called The Saguaro Minute on KXCI, FM 91.3 in Tucson, featuring interviews with scientists, park rangers, culture bearers, artists, anthropologists, and more. Act II also incorporated a saguaro fruit harvesting workshop with Tohono O’odham elders in Saguaro National Park. 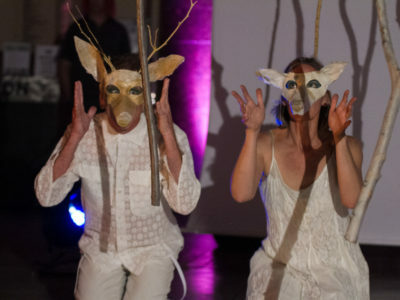 ACT III brought live performance to Saguaro National Park including the Saguaro Centennial Ball featuring dancers in formal attire dancing with saguaros on the eve of the National Park Centennial and a site-responsive immersive theater experience blending story, song, poem, and dance informed by Acts I and II of the project and performed by an ensemble cast in and around the Park visitor center. The project was made possible with funding from the National Endowment for the Arts, the Southwestern Foundation for Historic Preservation and Education, the University of Arizona’s Agnese N. Haury Fund, Arizona Commission on the Arts, Puffin Foundation, Mary Jo Ghory, and individual donors.